Stephen Curry has revolutionized the NBA with his shooting ability—but somehow still does not get the respect he deserves. The Crossover breaks down his historic shooting numbers. In a vacuum, Kevin Durant is a better basketball player than Stephen Curry. He’s taller, he’s a better defender, and his offensive game is more well-rounded. On the Warriors, Curry is the more important player. 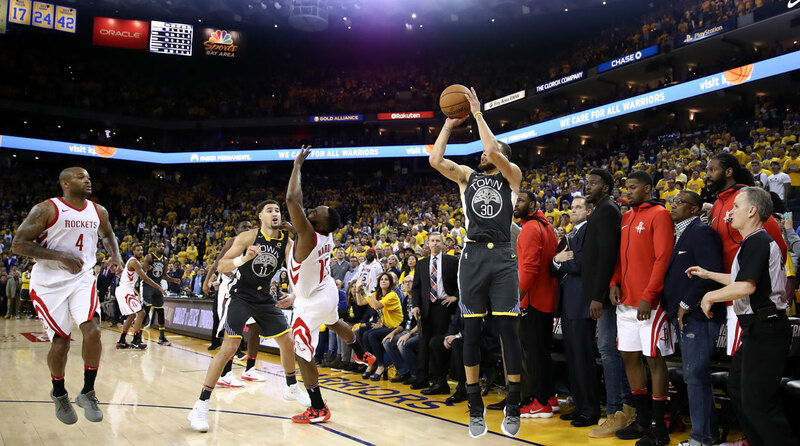 For the last four seasons, and particularly during his second MVP campaign, Curry’s shooting skill was so absurdly threatening that it almost broke the NBA. Every championship contender worth a damn had to have a small lineup for Golden State, or at the very least a very mobile center, because otherwise they stood no shot at defending Curry on the perimeter. Steph’s three-point abilities stretch defenses like never before, and his activity off the ball makes Golden State nearly impossible to guard for a full 24 seconds—that is, when the Warriors are committed to playing their style of basketball. The Curry vs. Durant debate can and will rage on through these Finals. You can pick any side you want and the sun will still come up tomorrow. On the eve of his fourth straight Finals, I just wanted to highlight how absurd Curry’s shooting has been over the last few years. Let’s run through some stats. • In the last four regular seasons, Curry has made 1,224 threes. That’s more threes than these players hit in their career: John Starks, Dennis Scott, Rasheed Wallace, Tracy McGrady, Gilbert Arenas, Allen Iverson, Scottie Pippen, Damon Jones, John Stockton, Clyde Drexler, Robert Horry, Jalen Rose and Larry Bird. • Curry has hit more pull-up threes in the last four years (615) than Steve Francis made any type of three (575) in his entire career. • In his unanimous MVP season, Curry hit about 221 pull-up threes, which would’ve been the seventh-most threes hit by anyone this season. Curry’s 221 pull-up threes in 2016 would have led the league in all threes in 2011, and would have been a top-three mark in 2015, 2014, 2013, 2010, 2009, 2007, 2006, 2004, 2003, 2002, 2001 and 2000. • Curry would have to miss 3,154 straight threes to fall 0.1% below Charles Barkley in career three-point percentage. • Curry hit more threes in 2016 (402) than five teams hit during the 1996–97 NBA season. • At his current pace of roughly 3.4 threes made per game, Curry will pass Ray Allen for first place in career three-point field goals made during his age 33 season. Allen hit his final three at age 38. We can keep going, but the point is, when it comes to volume and efficiency, the NBA has never seen a shooter like Steph Curry. It can (and will) be easy to get caught up in LeBron’s greatness during the Finals. For a variety of reasons, Curry has seemingly never gotten his due as one of the league’s most game-changing forces. Curry may never overwhelm with his physicality or athleticism. And he certainly looks like less of a superstar than Durant, who himself will retire as one of the league’s all-time greats. But the next time Curry goes on one of his third-quarter flurries and effectively shoots a team off the floor, remember that his skillset is one the NBA has never seen on such a high-volume level, and may not see again for a very long time.